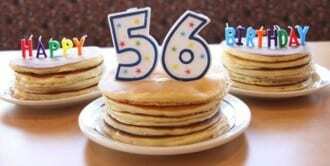 Celebrate IHOP’s 56th Anniversary with 56 Cent Pancakes! On Tuesday, July 8, 2014, IHOP is celebrating 56 years with their famous Original Buttermilk Pancake Short Stacks only .56 at participating locations from 7 AM to 7 PM. One short stack (3 pancakes) per guest and cannot be combined with any other offers. For more info or to find a participating location, please head here.